Jamie Crone, pictured here against Hailsham Town last Tuesday, struck twice in Little Common's 3-1 win away to Storrington. Little Common Football Club is through to the quarter-finals of its divisional cup competition. The Commoners won 3-1 away to Storrington in round two of the Macron Store Southern Combination League Division One Challenge Cup tonight (Tuesday). 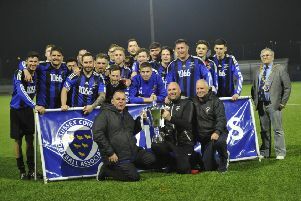 On a freezing night in West Sussex, Jamie Crone gave Common a fourth minute lead against a Storrington team which Common beat twice in the league before Christmas. Russell Eldridge’s side remained in front for virtually an hour until Josie Stakim, who scored Storrington’s winner against Bexhill United in the league on Saturday, levelled in the 63rd minute. Two goals in the space of six minutes, however, put Common through to a home quarter-final against Selsey on a date to be announced. They went ahead again when Crone netted his second of the night in the 79th minute and Lewis Hole netted in the 84th minute to give Common a repeat of their 3-1 league win at the same venue during October. Common and Selsey will go head-to-head for the right to meet Langney Wanderers in the semi-finals, while Bexhill are through to the last four in the other half of the draw.